This is easily my simplest recipe to date – and the most naughty – but really delicious. 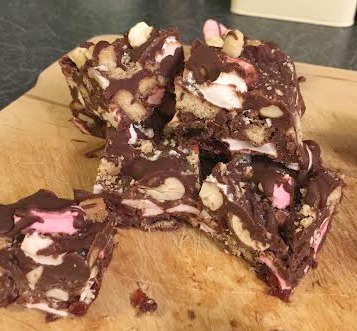 My favourite thing about Rocky Road is that essentially you can add anything you like, and leave out what you’re not so keen on, this is just my personal favourite combination. Check out my Recipe Roundup page for previous foodie posts. Switch to milk or white chocolate if preferable. 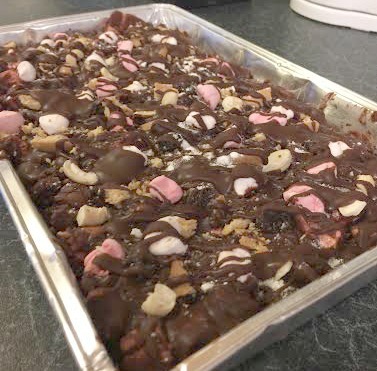 Try a new theme for your Rocky Road depending on the season – white chocolate and Mini Eggs for Easter or add spooky jelly sweets & drizzle with green icing for Halloween. Are you economising this Christmas? These make a fab homemade gift when stacked in a clear cellophane bag and decorated with a festive ribbon and tag. Chop up leftovers for a fab ice cream topping! Hope you enjoy these treats and please subscribe or follow me on Twitter & Facebook for future recipes as well as general parenting mayhem. Oh wow! These look amazing! Thanks for sharing. Oooh I must try this!